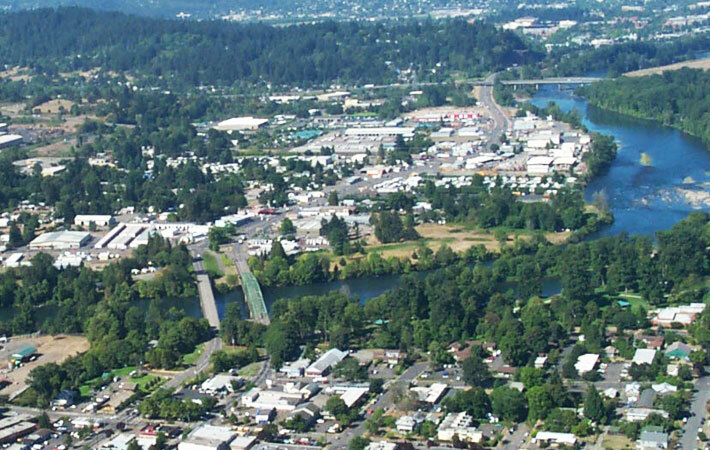 Glenwood is an urban renewal district in Springfield, Oregon, situated along the banks of the Willamette River, approximately one square mile stretching from downtown Springfield to the neighboring city of Eugene. Glenwood is currently developed with a mix of residential, industrial, and commercial land uses. Until this point, a general lack of urban services has hindered further development and redevelopment. The recently completed and adopted Phase I Glenwood Refinement Plan (GRP) has since established a vision for the Glenwood Riverfront corridor through an integrated framework of land uses, natural resources, public facilities, and economic development opportunities over the 20-year plan period. Based on past experience, the city council knew it needed to focus on developing the riverfront but also address issues that impacted the surrounding communities like infrastructure planning, bridge replacement, interchange redesign, business relocation, and tax increment financing to make development that much more successful. It was during this same time that the city endorsed a hybrid multi-way boulevard concept for Franklin Boulevard, a major artery leading to the heart of the Glenwood riverfront. Aerial Image of Glenwood from Downtown Springfield. Led by a team of senior planners, representatives from Springfield departments and Lane County joined together to coordinate and execute the rebirth of the GRP. Simultaneously, a Springfield Planning Commission-approved Citizen Involvement Plan was adopted to establish communication and transparency with the public from the start. The Citizen Involvement Plan called for the creation of a Citizen Advisory Committee (CAC) and Technical Advisory Committee (TAC), which allowed for citizens to engage with the technical minds from the public agencies and private companies behind the revamped plan and provided an outlet to collect feedback to better inform the GRP. 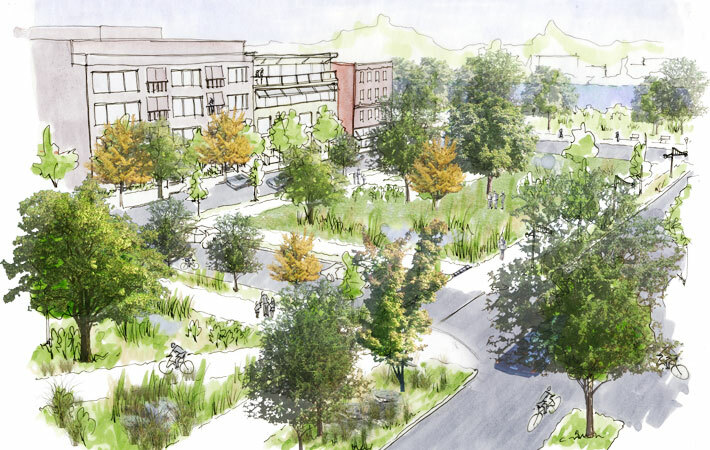 Future Neighborhood Urban Park Block, a Green Finger Extending from Franklin Boulevard to the Willamette River. The Oregon Department of Land Conservation and Development officially acknowledged Phase 1 of the Glenwood Refinement Plan in May 2014. While implementation of the plan is still in its infancy, great strides have already been made with new construction projects following the development guidelines put forth in Phase 1. Within the past two years, a $6.4 million Planned Parenthood facility was built; development began on a $9 million suite-style apartment project; Lane County's Housing Authority and a local nonprofit affordable housing provider submitted for annexation and pre-development of a 150-unit workforce housing development; and a $42 million riverfront convention center and adjoining hotel development project was proposed. The City of Springfield also has completed or is nearing completion on several major infrastructure enhancement projects including a $4.4 million viaduct/multi-use path and installation of a pedestrian-activated crosswalk warning system; a $3.4 million extension of the Glenwood Trunk Sewer; and completion of Franklin Boulevard environmental reviews. In the next 36 months, the city will conclude the construction of a $9.5 million first phase redesign to Franklin Boulevard, a vital multi-modal connection for the GRP redevelopment area, and the construction of a $200,000 pedestrian connection into the GRP area.